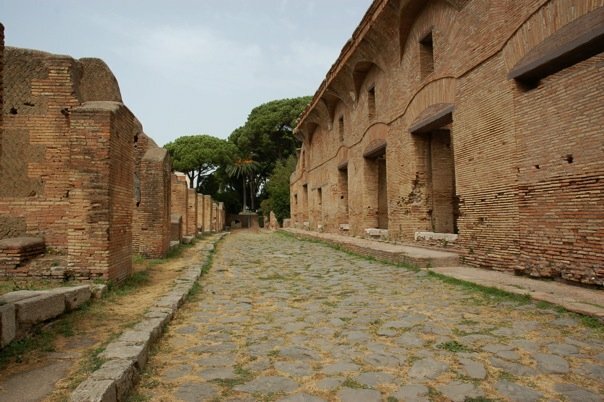 town that you can walk through, like Pompeii, with amazing frescoes and mosaics. Saw a bakery with the mills still inside, and a Roman wine bar which had shelves for the glasses and a painting of a plate with a carrot on it! We had ice creams, naturally, and after lunch we were given an hour and a half to explore. It’s so amazing as hardly anything is cordoned off, so you can go in and on the buildings. My highlight was the most fabulous mosaic in the Baths of Neptune – you just don’t expect to see so much still there, perfectly preserved. 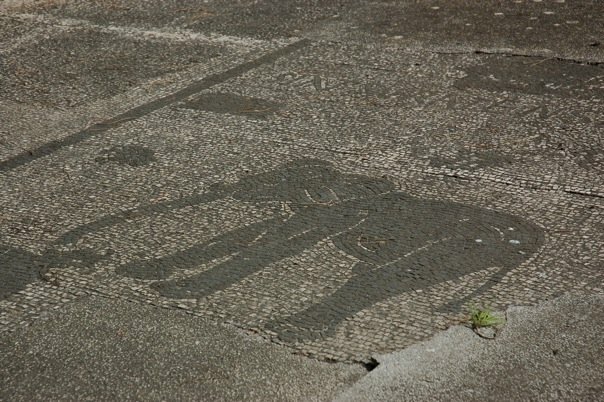 Another wonderful sight was the Forum of the Corporations, with mosaics which included one of an elephant, and one of an amphora with the owner’s initials on it! Truly incredible. On the way back we stopped at the Isola Sacra, a necropolis near Ostia, which was also amazing – lots of grave monuments which you could go inside, spectacularly well-preserved. We also saw a massive black and yellow spider – urgh. 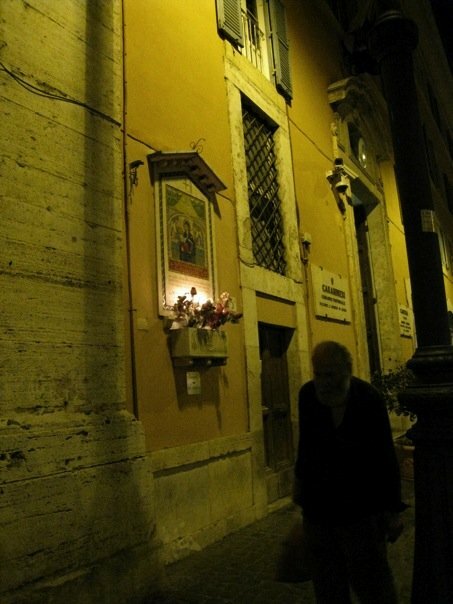 Just got back from a lovely evening out in Rome. We don’t get fed on Saturday evenings so we went out en masse in search of a restaurant. After much debate about where we were and which direction we should be going in to reach a pizzeria that one of the girls had heard about, we found it, and there was a long queue. It had taken so long to get there that we decided to wait anyway, and even though there were 9 of us we got a table in about 20 minutes. I looked up the place in my guide book and it turns out that it’s the most famous place in Rome to eat pizza – hence the queue! It’s called Da Baffetto and it’s somewhere near Piazza Navona. The pizza was great and the meal in general was lovely as everyone gets on really well. After the meal we got gelati – I had pannacotta flavour – before trying to find the way home. 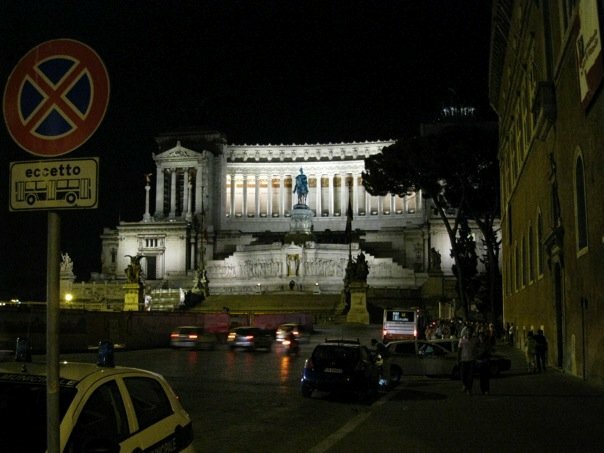 We got rather lost and somehow ended up at the Vittorio Emmanuele monument – the opposite end of the Via del Corso to the one we were aiming for! So we got the bus back and luckily it turned up pretty much straight away. So all in all it’s been a really good day and I’m having a great time here in Rome. It’s rather surreal to be here, spending all day looking at ancient monuments with people I only just met but whom I feel like I’ve known ages. Anyway I’d better turn in. We’re not leaving til 9am tomorrow and we’re buying breakfast somewhere nice so that should be good. This entry was posted in Looking back and tagged Baths of Neptune, British School at Rome, BSR, Da Baffetto, Forum of the Corporations, Isola Sacra, Italy, Ostia, Piazza Navona, Rome, Via del Corso, Vittorio Emanuele Monument. Bookmark the permalink.